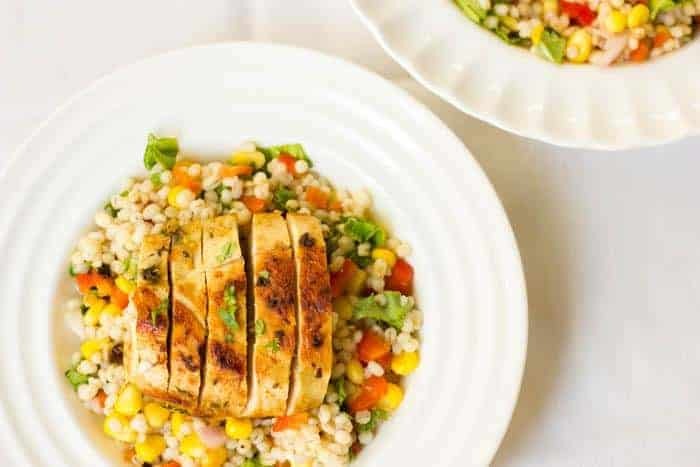 This barley chicken salad is more like salad for dinner because it’s so hearty! Tossed in a simple herb vinaigrette, the flavours really shine in this light and easy salad. Serve it cold or warm because this is also perfect for meal prep. This post happened after multiple scoops of ice cream. Roasted Almond. How I love the flavor. Nutty, woody and that sweet sweet ice cream. I still can’t get over it. 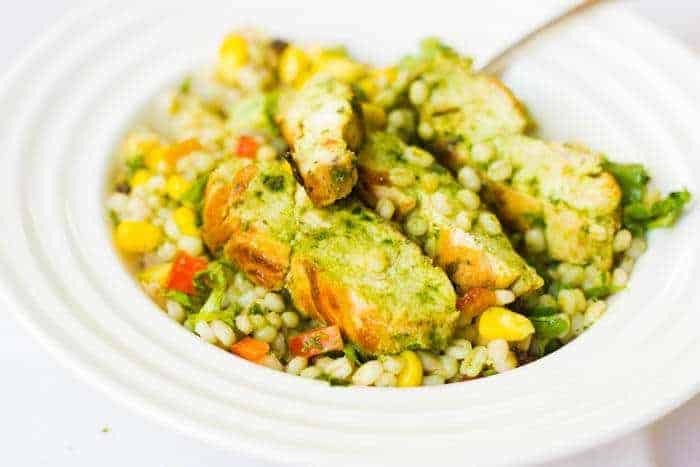 Or this Barley Chicken Salad with Herb Vinaigrette. The guilt of eating too much ice cream took over and I decided to whip this up. I recently bought some Pearl Barley after I saw a few recipes on Pinterest. I had only heard of Barley water till now, which is fed to people with an upset stomach. 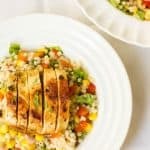 In fact that’s the first thing my help said when she saw I was cooking Barley but you can make this salad with any whole grain. It’s also a great way to use left over brown rice. And this vinaigrette. 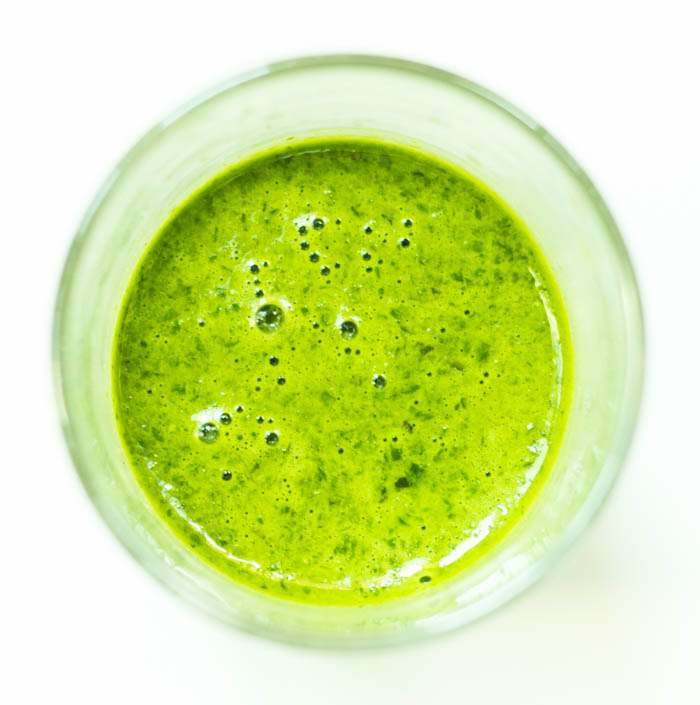 Oh this vinaigrette! By the way, it took me multiple tries to get the spelling right. Just between you and me, if you ask me now, I still won’t be able to tell. But this vinaigrette is oh so delicious. I can literally have it for breakfast, lunch and dinner. I kinda did too but I can’t be blamed and you will have to try it for yourself to agree! Just chop up some veggies and toss it all together. Salad done. And you can store the dressing for a couple of days in the fridge. It may not last. I even dunked some toast into it and drizzled it on eggs this morning. Bah. I can keep talking about it but you don’t have to listen. Go make this salad. Now. I insist. And by the way, I had mine with some chicken breast to make it a meal. If you are vegetarian, don’t worry, you can easily toss some paneer or cottage cheese with it or without. Pure awesomeness! 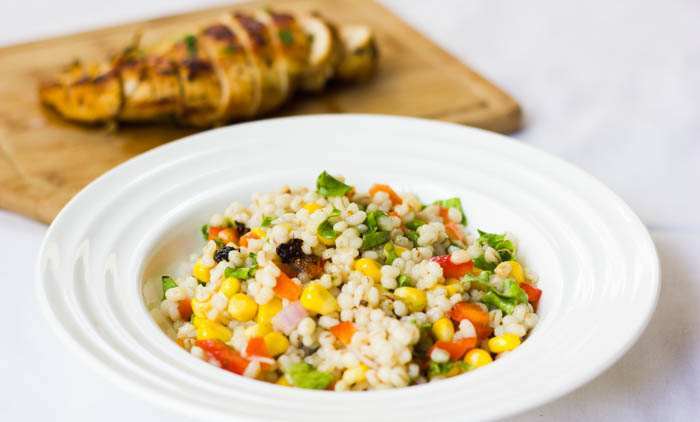 This barley salad with herb vinaigrette is a great way to use up left over veggies and grains. 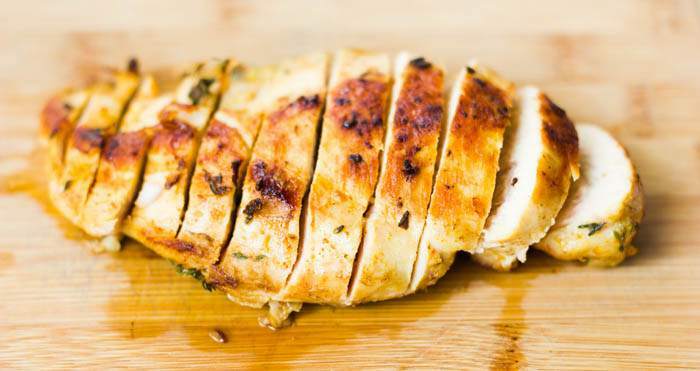 Add some meat and it becomes a great lunch or dinner option. For the vinaigrette, pulse all the ingredients together till almost smooth. You should be able to see small speckles of the green goodness. Toss all the other ingredients together and pour vinaigrette on top. I used sweet corn, red and yellow capsicums, onion and tomatoes for the vegetables. What a fabulous and simple, one-dish meal. 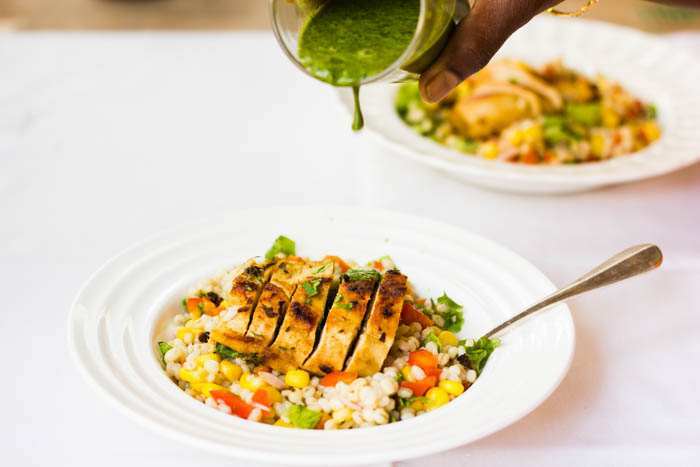 I love your dressing – like you, I’m attracted to the idea of packing fresh herbs into a dressing. I’ve never heard about using barley water for an upset stomach – sounds like a wonderful piece of advice.